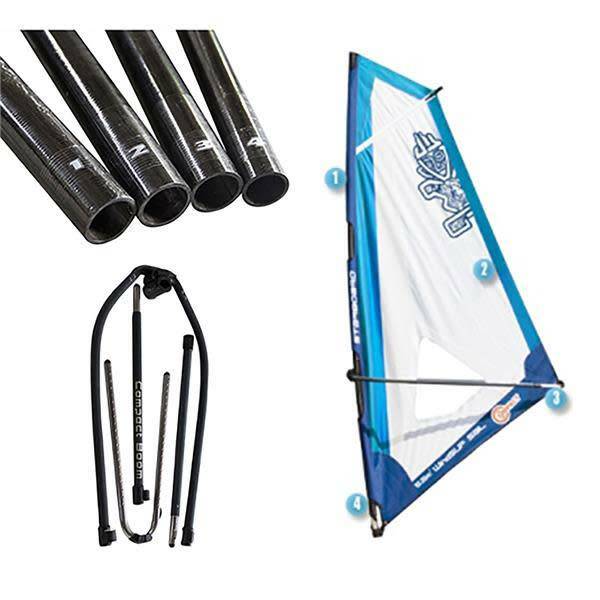 The WindSUP Sails are designed to power paddle boards fitted with mast tracks and light wind windsurfing boards. They aim to make windsurfing as simple as possible. They are light, powerful and designed specifically for light wind windsurfing. Available in two styles: the Classic and the Compact and three sizes: 4.5mÂ², 5.5mÂ² and 6.5mÂ². The WindSUP Sails have undergone subtle refinements such as having a new, longer second batten to improve medium to high wind performance. The boom head lever and clamp design has also been upgraded for a more ergonomical fit and a stiffer mast connection. The WindSUP Sails bags are also now made from recycled plastic bottles in partnership with Waste2Wear. The WindSUP Classic uses a two piece mast and a two piece boom and comes complete with extension, uphaul, mast base and bag. Powerful and easy to assemble. Available in 4.5mÂ², 5.5mÂ² and 6.5mÂ². The WindSUP Compact uses a four-piece mast and a three-piece boom to fit into a more compact bag. The preferred option for traveling windsurfers and those with limited storage space.